Leading Yorkshire property developers Wilton Developments have linked up with Leeds College of Art to install some stunning artwork at the award-winning 10 South Parade in Leeds, on behalf of the buildings owners East Parade Ltd.
10 South Parade, one of the most distinctive office buildings in central Leeds, has recently undergone an extensive refurbishment, leaving just 5,600 sq ft available to lease A crucial part of this refurbishment are six works of art, which showcase the talent of the students at the College of Art and reflect the history and culture of Leeds. Elli Whitefoot of Leeds College or Art commented: “At Leeds College of Art, we work with many external organisations on projects and commissions, to provide our students with experience of answering live briefs in a professional capacity. 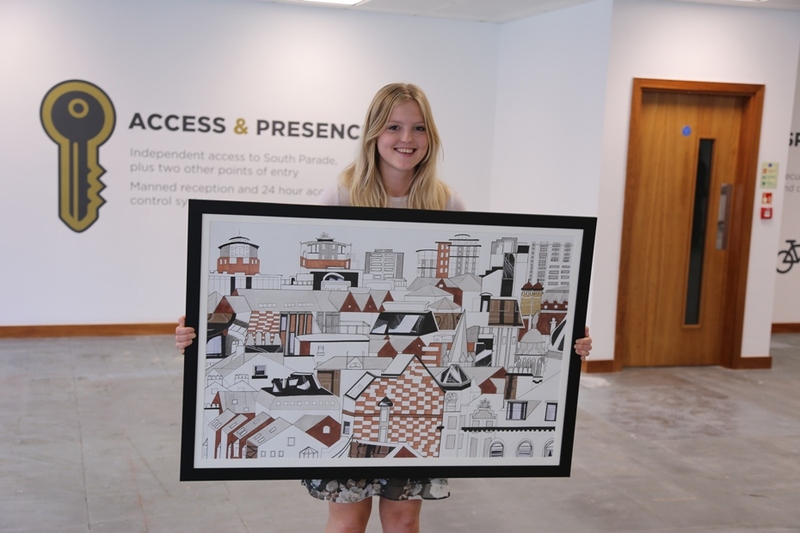 “We were really pleased when Wilton Developments approached us, interested in utilising our students’ talent to provide six pieces of artwork for the refurbishment at 10 South Parade. “The brief was open to final year students studying BA (Hons) Fine Art, who were asked to submit concept designs which referenced Leeds City Centre, 10SP as a building and commerce in the city. The students were: Christine Cheseldine, James Taylor, Kingston Poplar and Lilly Sutton Parsons. Jason Stowe, managing director of Wilton Developments, said: “We are really pleased to team up with Leeds College of Art and to encourage and nurture local artistic talent. The artwork of the students is of the highest quality, perfectly complimenting the particular ambience of the building. 10 South Parade has previously won the North of England, Wales and Northern Ireland British Council for Offices Award for best Refurbished/Recycled Workplace. The project was praised for transforming a tired 1970s office building into a Grade A modern office building which is taking on and successfully competing against the very best brand new buildings in Leeds City Centre. It now delivers 36,000 sq ft, over five floors, of high quality, air-conditioned accommodation with Grade A specification including a new glazed fourth floor featuring balcony areas, raised floors and suspended ceilings. Eamon Fox, partner with global property consultancy Knight Frank in Leeds, who represent Wilton Developments, said: “10 South Parade is a tremendous example of a high-quality city centre office building, which has stood the test of time. Expanding transport planning and infrastructure design consultants SCP have recently taken 2,550 sq ft of quality office space, leaving just 5,600 sq ft available to lease. The joint marketing agents for 10 South Parade are the Leeds office property consultancy WSB.